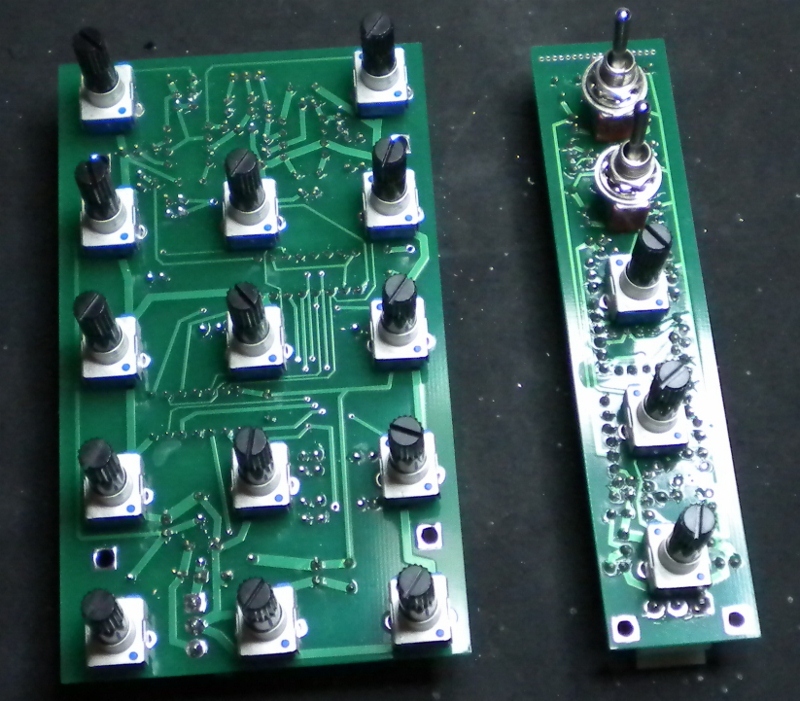 Have pretty much settled on the modules and designs for 6 panels. 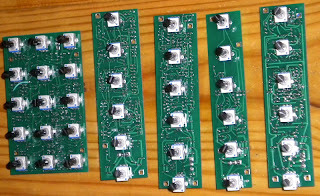 Nearly all the PCBs are here, panel designs are not all finalised, so there may be some changes. Feel free to send me suggestions. 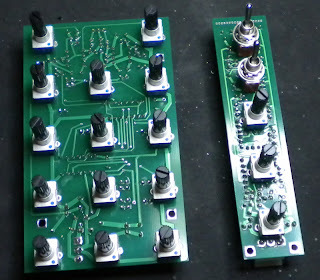 I have a few proto-type modules in mind that may get into Panel 5 if they work out. 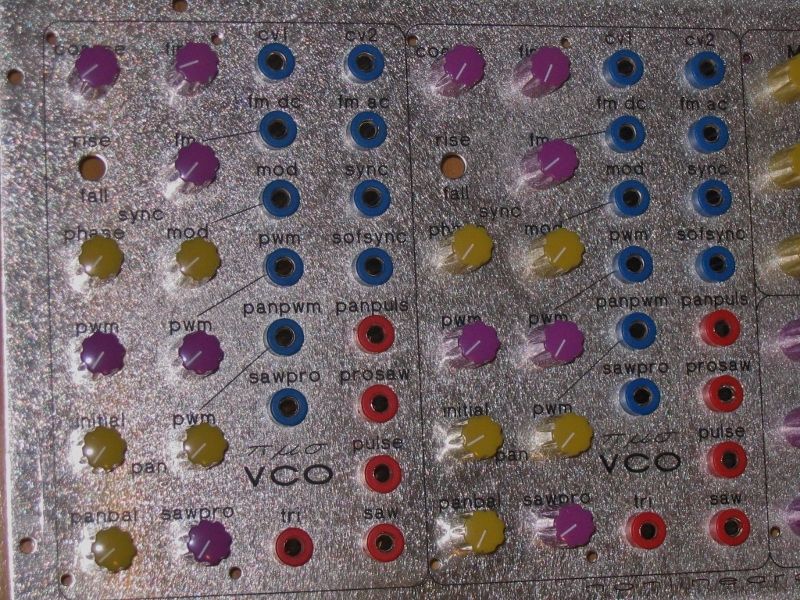 Panel 4 - CMOSC (6 simple CMOS drone oscillators with gate selectable frequency control and sync function), 4 stage Thru & Hold, 4 stage Sample & Hold (these each have CV inputs and 4 individual gate controlled outputs), Four Squared Logic, The Great Divide, 8-bit Cipher, dual bi-directional switches. Panel 5 - two Envelope Generators (based on Korg 3100 designs but modded for CV control of Attack/Decay, extra outputs and retriggerable), dual DC mixers, four Utility VCOs (these are 1V/oct and range from approx 0.1Hz to 8kHz so can be used as LFOs too), twin-T VCF with voltage controlled resonance, VC Wave Clipper, dual analogue Neuron. 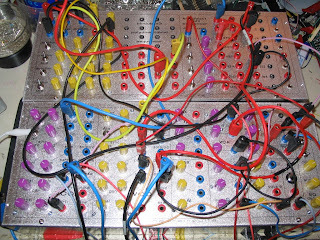 been playing with the sequencer panel and VCO panel together. kinda pleased; the phase modulated sync, CV pan pulse and CV processed saw functions on the VCOs make for some pretty interesting sounds. 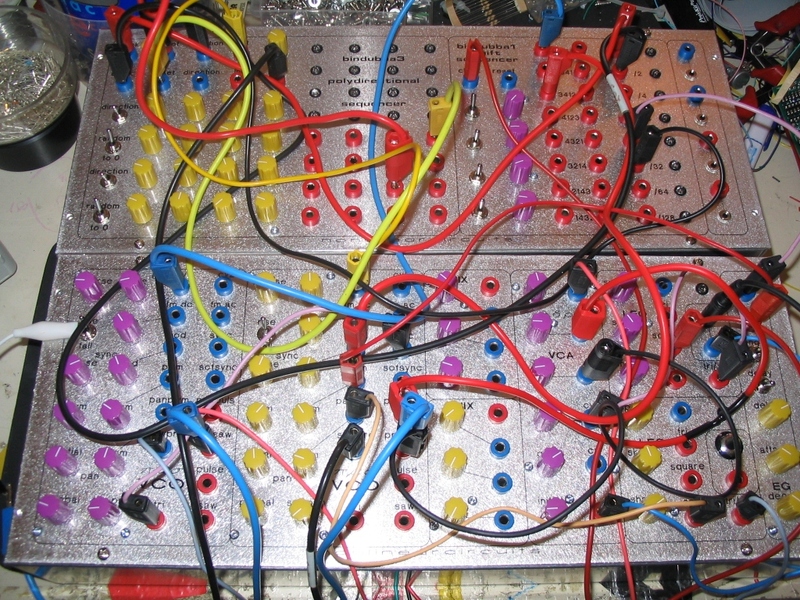 this circuit was in a paper I had to read, it looked interesting so i built it with a few mods to suit synths. It can do a few different tasks, fed an audio signal and an envelope it can be a resonator/wave multiplier/gate. 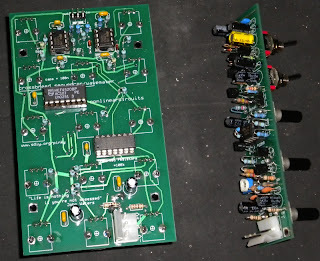 Fed two CV signals it turns them into something else. 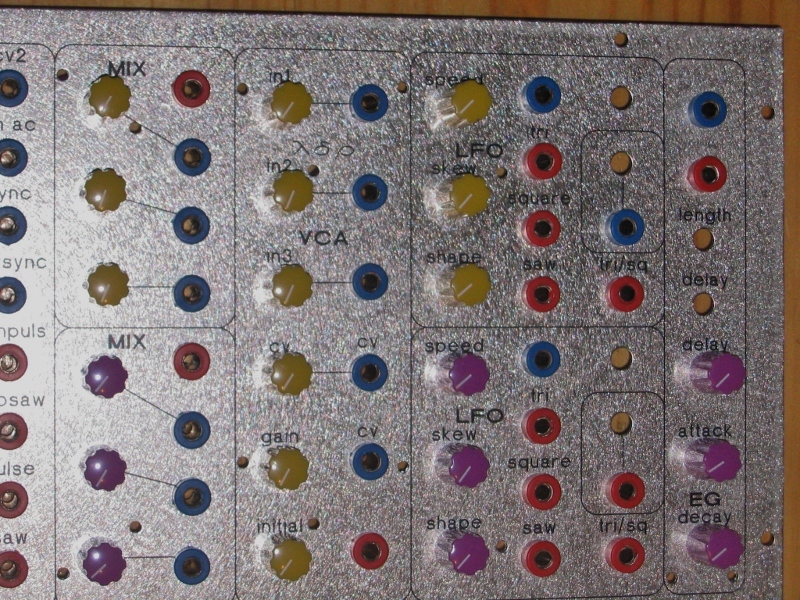 in the vid it is getting two LFO signals, as you can see, the output is all over the place. 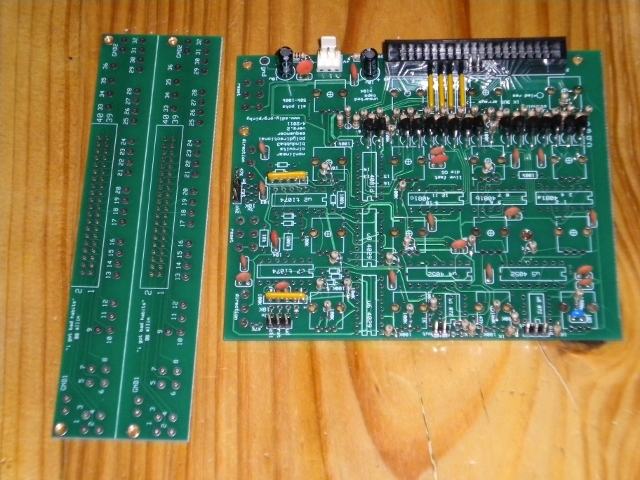 This is a layout for a dual VCA module. 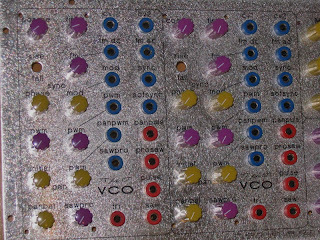 Each VCA has 6 separate inputs and outputs. 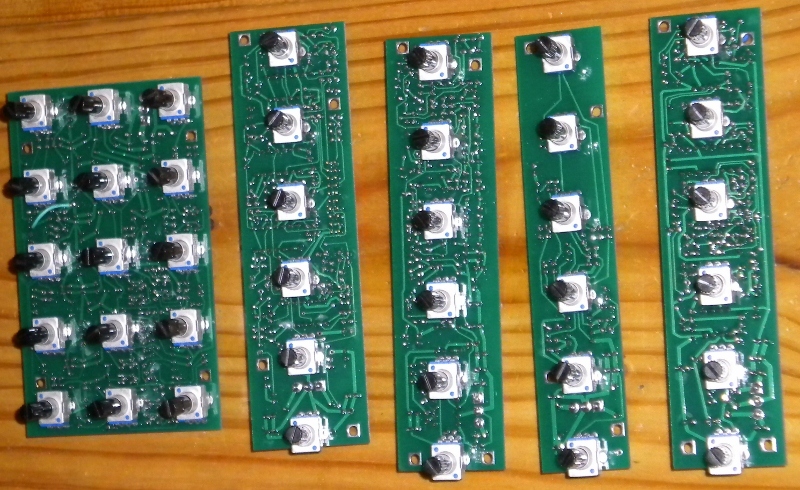 All 6 are controlled by the same CV/gain pot settings. 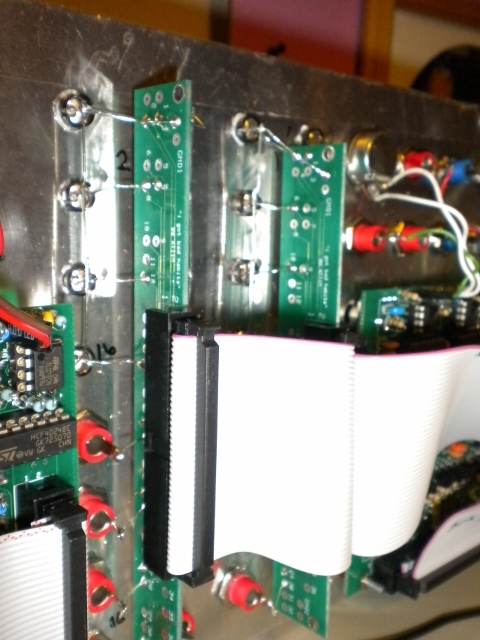 The VCAs are built around cmos 4009 inverters. 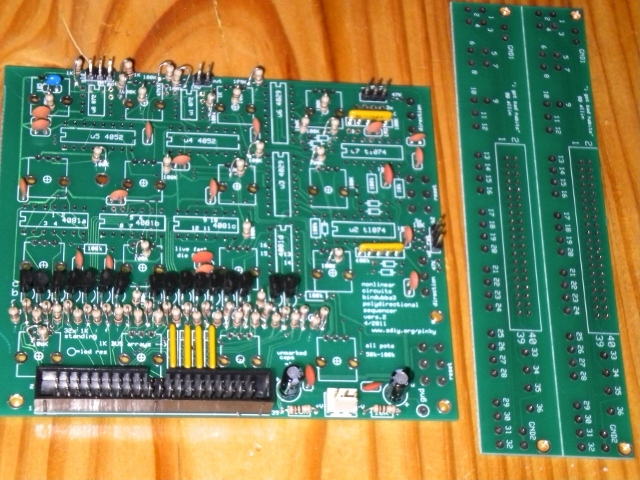 The PCB is rather compact, 26 electros, 4 ICs, 6 pots and well over 100 SMD resistors in 1.3x5.5 inches. 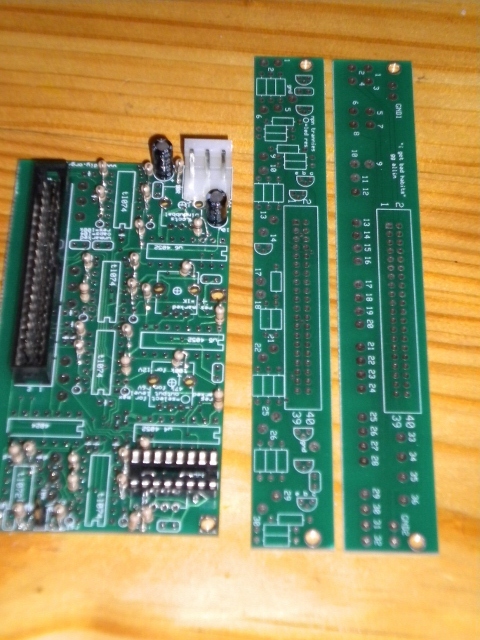 Resistors are mounted on the top and bottom of the PCB. 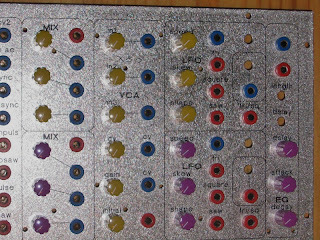 'Bleeding VCA' is a hint as to the ...erm... feature of this module. 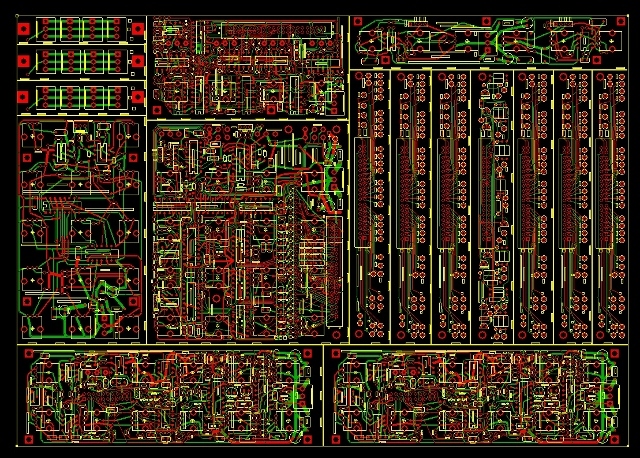 The overworked 4009 chips is going to suffer. 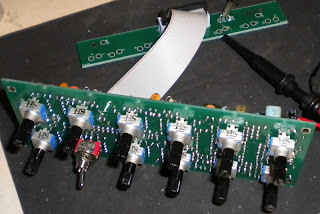 Anyway it is a unique VCA, the panel will have 4 attenuable CV inputs, 2 initial gain pots, 12 AC signal inputs and 12 outputs. 1. 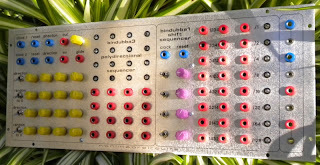 Tb303 filter clone with CV inputs for Cutoff, Mod and Decay. 2. 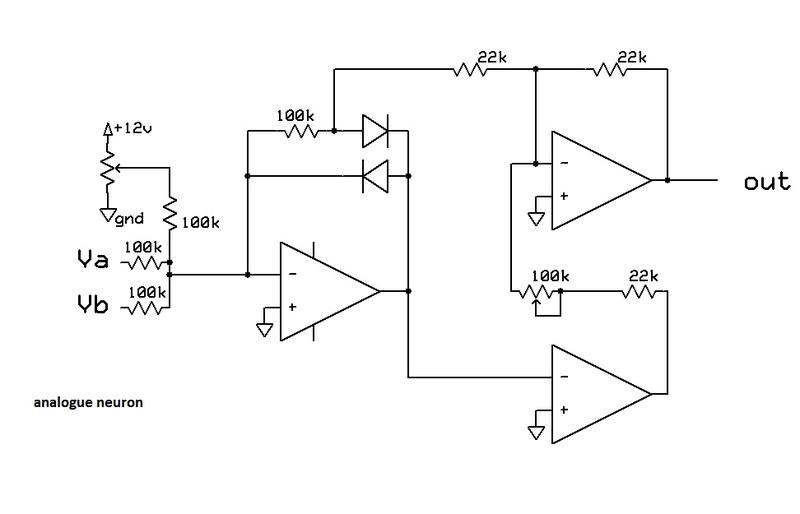 Filter based on the Arp4023 with added gain bandpass output and modded for LM13700 OTA, this also serves as a pretty decent VCO when the Q pot is set accordingly. 3. 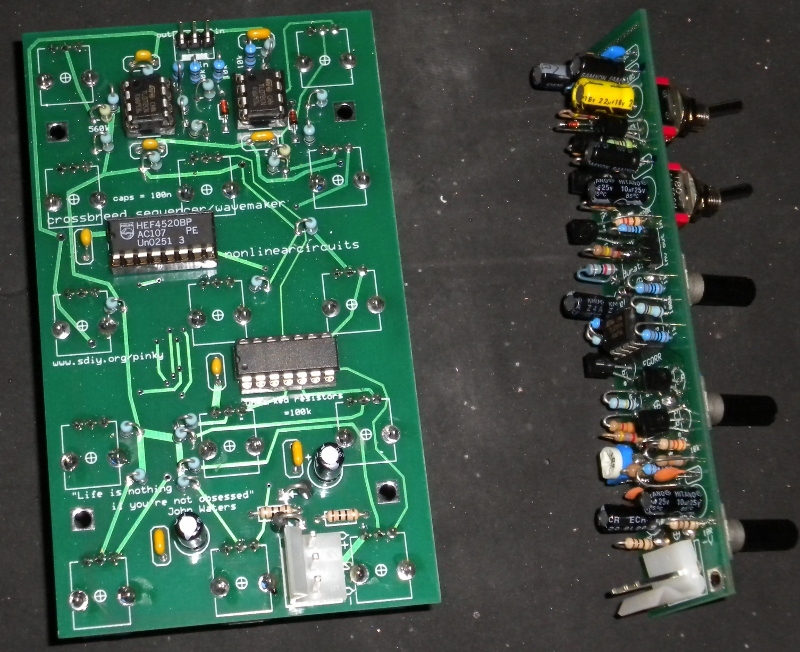 LDR based VCA, based on the one found in the Korg PS3200 and a schematic from an old Japanese diy magazine. 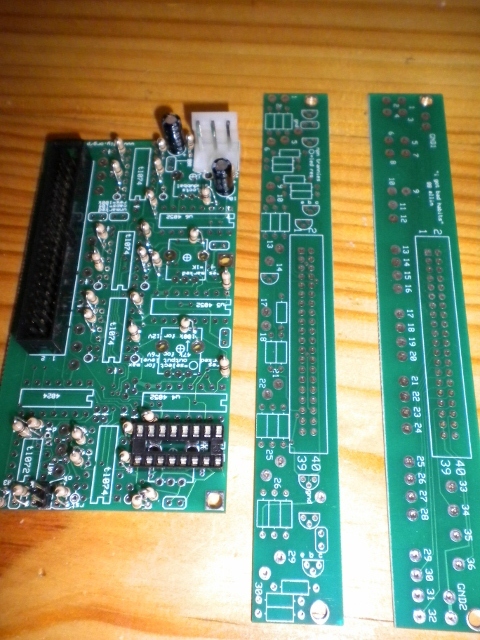 More bindubba1 & bindubba3 sequencer boards, a basic dual mixer, a 'crossbreed sequencer/waveshaper', two VCOs and jack/led/power breakout boards. 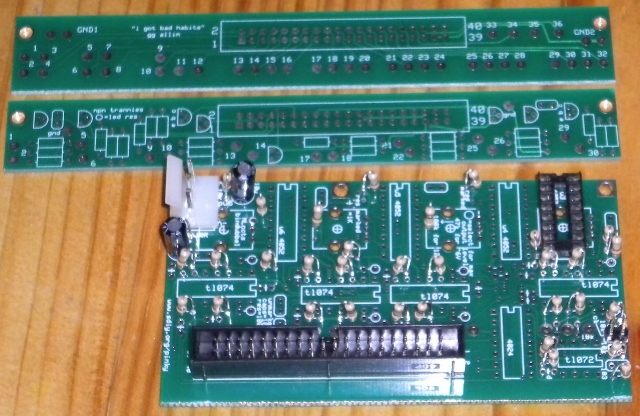 The Crossbreed started out life as a cross product generator from Electronotes using TTL chips, this version uses CMOS, which means less chips and less current draw. 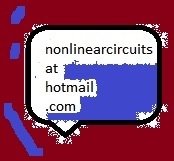 Anyway it can be fed two signals from VCOs, usually best if they are almost the same frequency, but not quite the same. The divisions and harmonics from these signals are then combined adjusted to obtain thicker (literally) waveshapes or carefully set up to create your own original animated waveforms. Animated because you can of course modulate the VCOs and obtain continuously changing waveshapes. 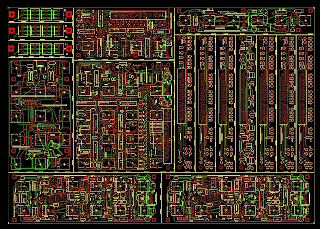 Guess I should record some demos and post some oscilloscope shots for this to make sense......okay soon. The name "Crossbreed" has two implications, one is the output is an audio waveform obtained from divisions and combinations of the input audio rate signals. 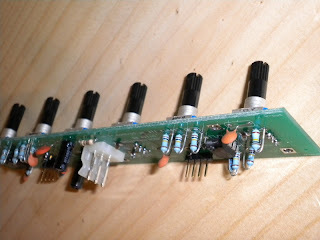 The other is that this module can also function as a sequencer providing extremely complex and interesting patterns as a result of being fed two different clock signals. 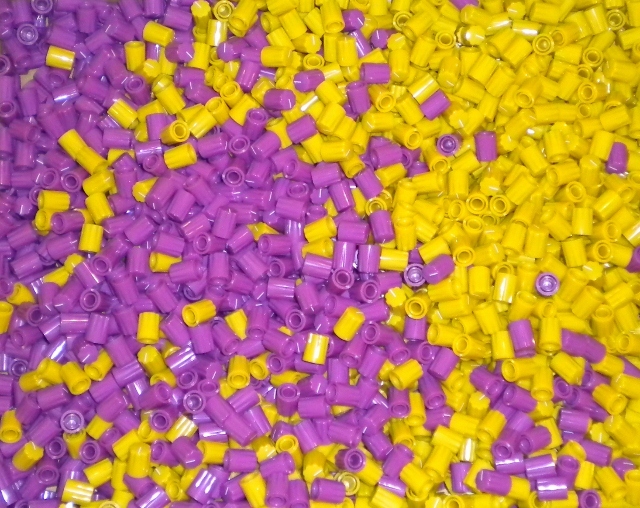 The VCOs are functionally based on the Aries AR-338 PMS VCOs. 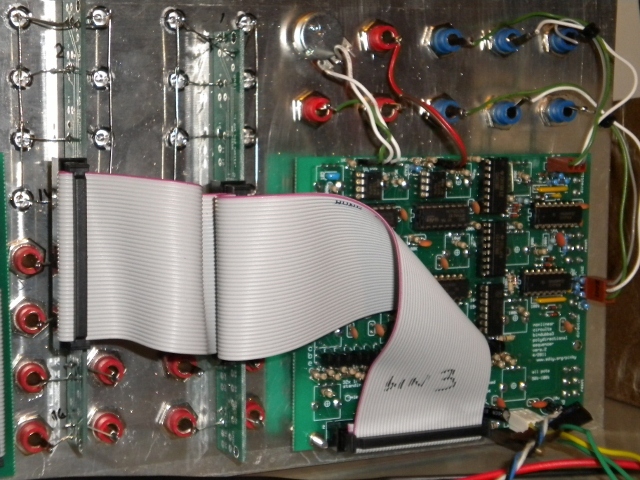 The AR-338 was built around the SSM2030 VCO IC, which is now very rare. So I used the well-known Mikulic sawtooth core from Electronotes (used in many VCOs - CGS, MFOS, ASM) and dressed it up a bit to get the AR-338 functions. So what does it do? 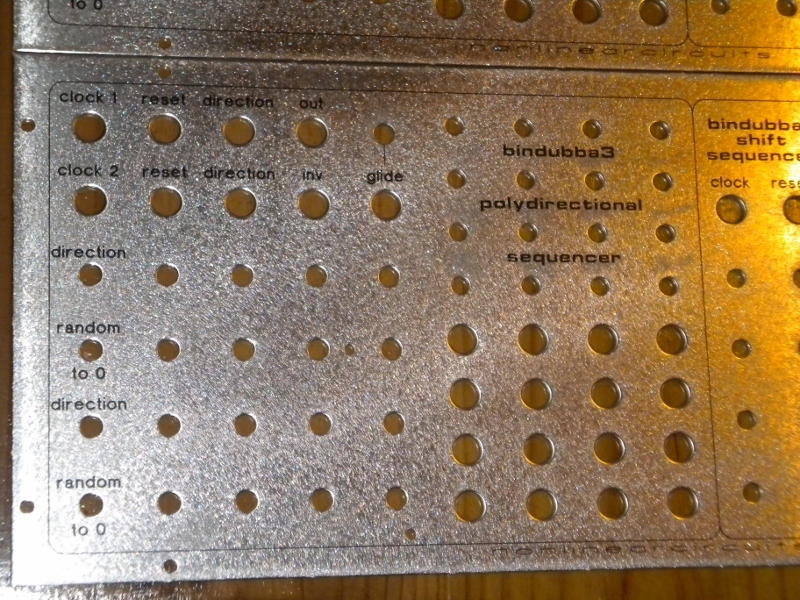 It emits sawtooth, triangle, pulse, processed saw and pan-pulse outputs. 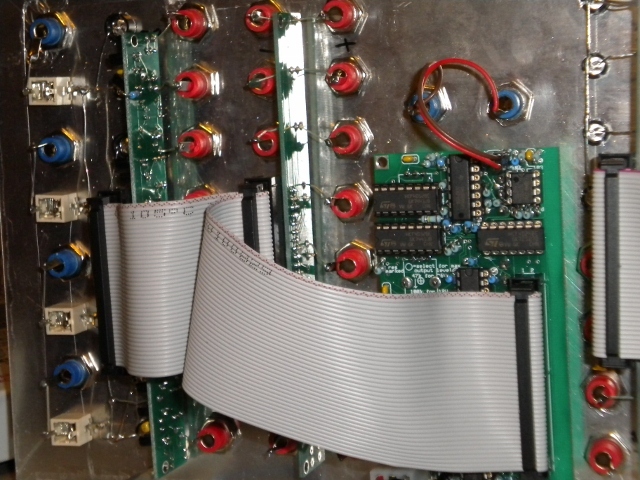 The pan-pulse is cross of the pulse and triangle waves which can be modulated by CV, it actually looks like the signal from Ian Fritz's double pulse waveshaper, although the circuits are completely different. The processed sawtooth can be adjusted to obtain a variety of waveshapes or CV can be used to morph it between different shapes. 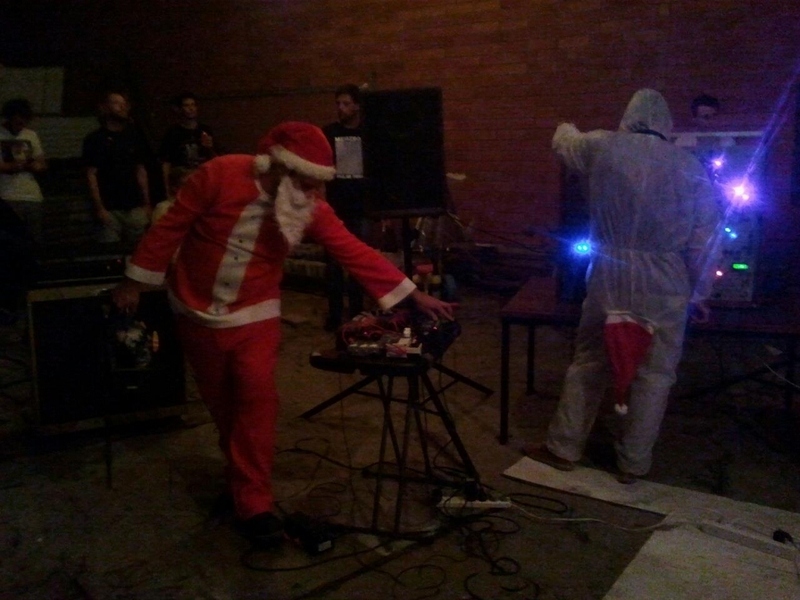 Now the PMS bit, which means (in this case) "phase modulated sync". Usually VCOs can be sync'd together in different ways, soft sync and hard sync (google it). The PMS function allows the sync to be shifted to different parts of the syncing signal; the rising edge, falling edge or anywhere in between. Of course it can be CV'd to give... (well fk me@!) phase modulated sync! 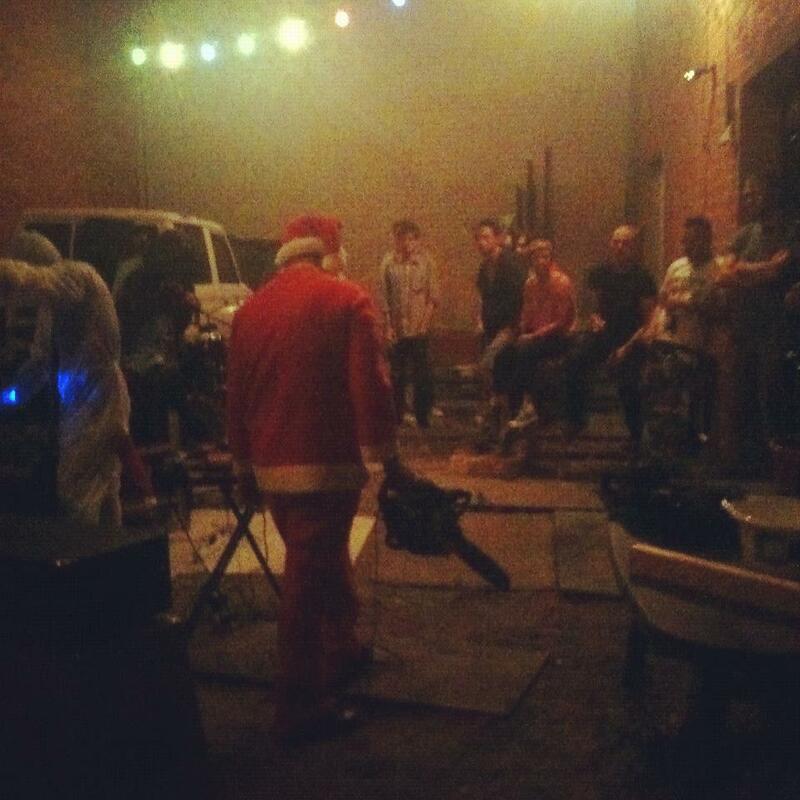 Guess I will get some mp3s and 'scope shots up soon to make this clearer. 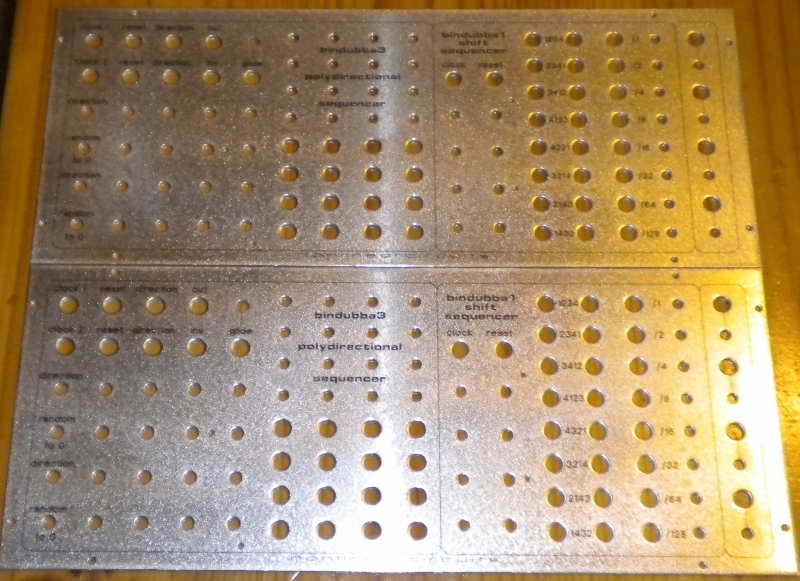 Panels for the sequencer boards are being manufactured this week and should be ready soon. 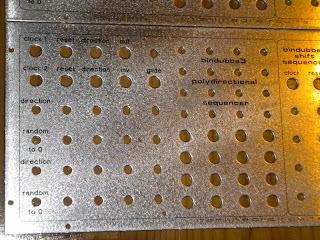 They look much the same as the paper-faced proto-type a few posts down but are bare aluminium with baked on black labelling. 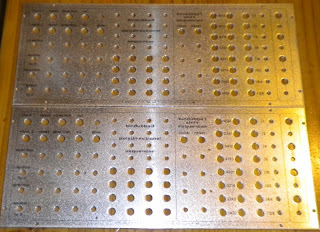 The company manufacturing them also do panels that are used in many radio & TV studios around Australia, so I am expecting them to be excellent and durable.